G7 is a group consisting of Canada, France, Germany, Italy, Japan, the United Kingdom, and the United States. These countries are the seven major advanced economies as reported by the International Monetary Fund. Formally called G8 with Russia in it, but due to Crimean crisis Russia was ejected from the group. The group meets annually on summit site to discuss economic policies, while the G7 finance ministers have met at least semi-annually, up to 4 times a year at stand-alone meetings. 2017 meet scheduled to be held at Sicily, Italy. G20 is an international forum for the governments and central bank governors from 20 major economies. 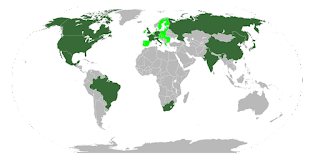 Members are Canada, France, Germany, Italy, Japan, United Kingdom, United States, Russia, Australia, Canada, Saudi Arabia, India, South Africa, Turkey, Argentina, Brazil, Mexico, China and Indonesia. It was founded with the aim of studying, reviewing, and promoting high level discussion of policy issues pertaining to the promotion of international financial stability. It seeks to address issues that go beyond the responsibilities of any one organization. The G20 heads of government or heads of state have annually met at summits, and the group also hosts separate meetings of finance ministers and central bank governors. G8 nation leaders said that G20 would replace the G8 as the main economic council of wealthy nations. Though the G20's primary focus is global economic governance, the themes of its summits vary from year to year. The G20 operates without a permanent secretariat or staff. In addition to these 20 members, the chief executive officers of several other international forums and institutions participate in meetings of the G20. These include the managing director and Chairman of the International Monetary Fund, the President of the World Bank, the International Monetary and Financial Committee and the Chairman of the Development Assistance Committee. The G4 nations comprising Brazil, Germany, India and Japan are four countries which support each other’s bids for permanent seats on the United Nations Security Council. The G4's bids are often opposed by the Uniting for Consensus movement, and particularly their economic competitors or political rivals. Uniting for Consensus or coffee table countries are Italy, South Korea, Canada, Pakistan, Argentina, Mexico, Turkey, Malta, Costa Rica, Colombia and San Marino. The United Kingdom and France have backed the G4's bid for permanent seats on the United Nations Security Council. The Maastricht Treaty established the European Union in 1993 and introduced European citizenship. The latest major amendment to the constitutional basis of the EU, the Treaty of Lisbon, came into force in 2009. The EU has developed an internal single market through a standardised system of laws that apply in all member states. Within the Schengen Area, passport controls have been abolished. A monetary union has been established within union but lacks common Fiscal union. EU is composed of 28 member states but only 19 EU member states use the euro currency. The Lisbon Treaty now contains a clause under Article 50, providing for a member to leave the EU. United Kingdom enacted the result of a membership referendum in June 2016 and is currently negotiating its withdrawal. The EU as a whole is the largest economy in the world. EU has a common foreign and security policy, thus developing a coordinated external relations and defence. The membership of EU entails a partial delegation of sovereignty to the institutions in return for representation within those institutions, a practice often referred to as "pooling of sovereignty". To become a member, a country must meet the Copenhagen criteria, of the European Council which requires a stable democracy that respects human rights and the rule of law; a functioning market economy; and the acceptance of the obligations of membership, including EU law. The four countries that are not EU members have partly committed to EU's economy and regulations - Iceland, Liechtenstein and Norway. The European Council gives political direction to the EU. Council of European Union acts together with European Parliament as a legislature. European Commission is the Executive arm. Court of Justice Of European Union ensures uniform application and interpretation of European Law. European Central Bank together with national central bank determines monetary policy. It is the regional intergovernmental organization and geopolitical union of nations in South Asia. Afghanistan, Bangladesh, Bhutan, India, Nepal, the Maldives, Pakistan and Sri Lanka are its members. Its secretariat is based in Kathmandu, Nepal. The organization promotes development of economic and regional integration. It launched the South Asian Free Trade Area (SAFTA) in 2006. SAFTA was envisaged primarily as the first step towards the transition to a South Asian Free Trade Area (SAFTA) leading subsequently towards a Customs Union, Common Market and the Economic Union. SAARC maintains permanent diplomatic relations at the United Nations as an observer and has developed links with multilateral entities, including the European Union. States with observer status include Australia, China, European Union, Iran, Japan, Mauritius, Myanmar, South Korea and United States.